On Sunday’s installment of Showtime’s The Circus, CNN Tonight host Don Lemon was profiled and he lashed out at President Trump as a “racist” and insinuated that Trump’s criticism of him was racially-based. Thankfully, the show also profiled our friends at the Daily Caller and, to the show’s credit, the interviews allowed for Daily Caller personality to offer some excellent points about liberal media bias. Mitchell correctly noted how Bush is “at odds with his party’s base” because of he has “endorsed the Obama Administration’s Common Core education curriculum and he’s passionate about the human side of immigration reform.” But rather than citing a mainstream conservative who has criticized Bush, Mitchell instead employed a soundbite from gadfly businessman Donald Trump. In her analysis of the vice presidential debate on the October 12 edition of Morning Joe, co-host Mika Brzezinski showed disdain for Paul Ryan and utter adulation for Joe Biden's performance. She was alone in her wildly pro-Joe assessment. The media's ongoing contribution to the Obama reelection effort is fairly obvious: omit or downplay news stories and polling data that cast the Obama administration in a negative light while hyping trivial Romney gaffes or media-manufactured tempests-in-teapots in order to focus the election narrative on the Republican candidate's deficiencies - real or or imagined -- rather than the incumbent Democrat's record. Mark McKinnon, a regular contributor to the liberal Daily Beast website, which owns Newsweek magazine, made a morbid gaffe as he commented on Texas Governor Rick Perry's stumble during the November 9 Republican presidential debate on CNBC. The New York Times on Wednesday quoted McKinnon labeling Perry's brain freeze as the "human equivalent of shuttle Challenger." Times writers Jeff Zeleny and Ashley Parker cited the Democrat, who once served as an aide to former President George W. Bush, as an example of how "Republican operatives almost uniformly declared it [Perry's gaffe] as a sign of great trouble for his candidacy." Vulgarity sure seems to be more and more commonplace on cable these days. On Tuesday, conservative talk radio host Rush Limbaugh accused the No Labels crowd of being a bunch of "washed-up losers." Chris Matthews said Wednesday that he can't tell what Howard Fineman's political leaning is. Chris Matthews Monday went on a twelve minute attack on former Alaska governor Sarah Palin that should make his fellow MSNBCers and the liberal blogosphere quite happy. Can a palm reader be president? What do we think of kids in school who write stuff on their hands to get through a test? What do we think of a would-be political leader who does it to look like she`s speaking without notes? What do we think of Sarah Palin this weekend answering pre-screened questions from a like-minded audience in Nashville, a tea party convention, and still having to put a cheat sheet on her palm to answer what she calls the basics of her beliefs? How can someone presume to be auditioning for president when they can`t even answer questions they know are coming? 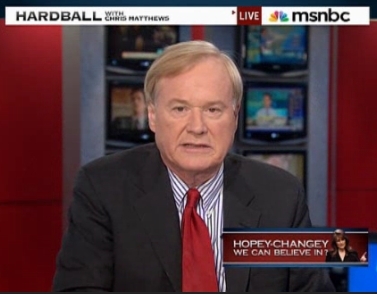 CHRIS MATTHEWS: So who will lead the tea-baggers? Will it be Rick Perry down in Texas? Will it be Michele Bachman out in Minnesota? Will it be Sarah Palin? You first Mark [McKinnon] it's your idea. The tea-baggers are an interesting group to watch. They're not far right. They're probably center-right, in fact some centrists. But they're generally, I think, Republican voters. Right? Is that fair to say? They vote Republican? MATTHEWS: And they're monochromatic right?